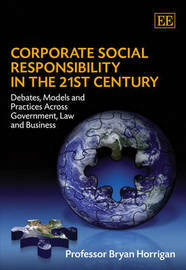 This timely and thorough book offers one of the most wide-ranging, inter-disciplinary, and cross-jurisdictional analyses of corporate social responsibility so far in the 21st century. Professor Bryan Horrigan spans subjects as diverse and topical as global corporate responsibility and governance debates, practical guidelines for responsible businesses and their professional advisers, governmental roles in corporate social responsibility, corporations and human rights, and the new era of `enlightened shareholder value'. He also highlights an emerging transnational and comparative body of law, regulation, and practice on corporate social responsibility. Illustrated throughout with meaningful controversies and examples, the book also highlights the major recent global developments in corporate social responsibility already this century, focusing especially on Europe, the UK, North America, and Australasia, and charting its future regulatory and research directions worldwide. The book's scholarly foundation, up-to-date coverage, and accessible style will appeal particularly to academic researchers and students of corporate social responsibility in the fields of law, business, management, economics, and political science in a number of countries. It will also be of great interest and use to those whose work involves corporate social responsibility within government, business, and civil society.